Islamorada is alive and well!! Both fishing and the weather this week were wonderful, with temps in the 80’s and sea temps around 78 along with light winds out of the ENE. There has been a steady pick on the Sailfish all week. Some days were a little better than others but the fish were here to be caught. Most of the tactics this week were raising the fish from the deeper water. This is when you need lots of free, chumming bait. Pilchards have been plentiful thank goodness! With several hundred of them in your live-well one can’t go wrong!! The ballyhoo have also been steady moving in, but the cigar minnows have seemed to vanish. There also was a bit of a King Mackerel bite in the first part of the week up to 20lb’s so that’s a pretty good sign for the upcoming weeks. Finally the reef fishing stayed pretty consistent as we had some flow this week so the snappers continued to bite. We also found some nice schoolie Muttons in about 85 feet of water. The Mangroves have pretty much left the Oceanside and are now making a big push to the backside. Not much for this upcoming Turkey week so tight lines and Happy Turkey Day. 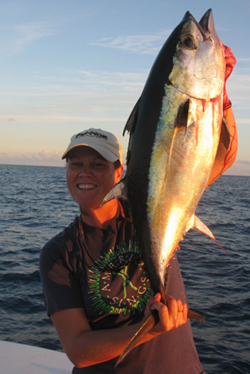 Our fishing is continuing to get better, with blackfin tuna showing up on some of our deeper wrecks off Key West. Earlier in the week, the reef and tuna fishing was slow. 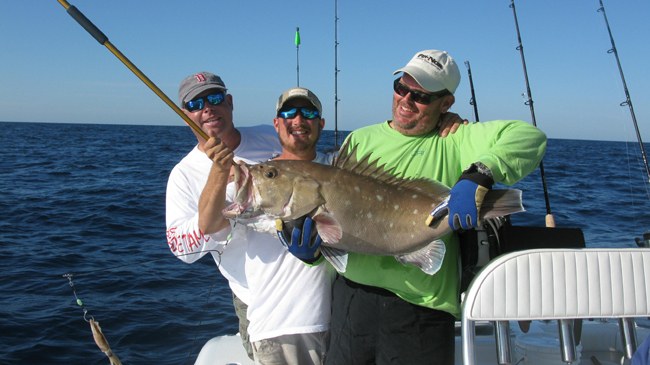 Angler Paul Depoo of Key West had a chance to get out deep dropping with us and managed a 25-pound snowy grouper in 650-feet of water, as well as a large barrel fish. But as the week progessed, fishing got better and better. 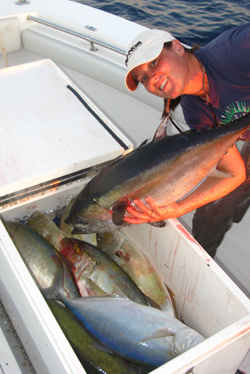 On Friday, anglers Ryan Muntin, Rob Neives and Julie Kunke teamed up for 5 blackfin tuna to 23 pounds, as well as a number of yellow jacks to 15 pounds. On a Saturday outing, Kuhnke, along with anglers John Stuempfig, Dale Emily and Noah Crawford, all of Key West, boated five blackfin to 20 pounds. It's a late afternoon/early-evening bite, so it’s a great chance to get out for a half day and get in some exciting fishing.There have been some sailfish around, but we haven't really been targeting them... that will change this week. Fishing is great and we have availability, so give us a call and I hope to see you out on the water! This weekend gave us some great fishing. We started off the trip bright and early Friday Morning. We picked up our bait on the way out and started running north. We finally found some decent blue water about 12 miles up and put the baits out. After a really slow morning we started getting some kingfish bites. Then the sailfish turned on! We had one come up on the kite but he didn't want to eat, so we pitched to him with a spinner and he took the bait. While we were fighting him we hooked another but pulled him off. We had a few more swing and misses and finally landed another. We ended the day going 2-5 on sailfish and having a bunch of kingfish bites. Saturday morning we decided to run back to the north where we had luck on Friday. There was no wind and no current. We fished up there for the morning without a bite. We ran back south about 15 miles and stuck it out the rest of the day and right at the end we got some good action. We caught a nice kingfish then landed a sail! It was a great end to a really SLOW DAY! Sunday we had two half day trips. I decided to run south about 7 miles and found some really beautiful blue water and put the baits out. Right off the bat we hook a sailfish on the Kite but he shakes the hook free. We send them back out and get covered up by kingfish. Near the end of the half day we hooked a double header dolphin and sail! We caught and released both to fight another day. On our second half we ran right back out to the same area. It started off slow then got really good. We hooked a double-header sailfish and landed both! They were Mary's and Mike's first sails! They did an awesome job on the fish! Some time went by and we caught a nice kingfish in the 30lb range. Then we got another double header sailfish hooked. We ended up losing both fish but, hey, can't complain! 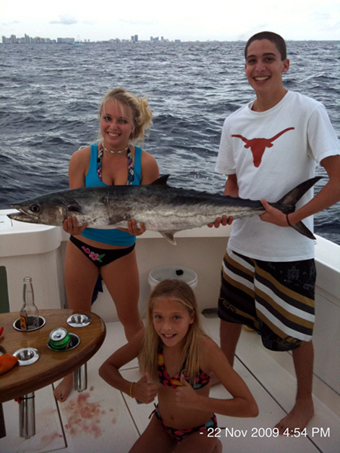 Nice Kingfish caught off Lauderdale! 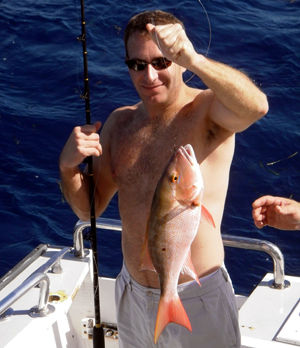 It was another great weekend fishing off of Ft Lauderdale on the PIMA II. Stripers continue to be the main stage in NJ this week. Fish continue to be up and down the beaches feeding on sand eels that are littered just off the beaches. Unbelievable non-stop action was what we encountered yesterday. I don’t think we went more than ten minutes without a bite. While most of the fish were blues we must have caught well over 30 in our half day trip. Blues to 13 lbs were consistently coming over the rails. We did have some keeper stripers mixed in with the blues. Every fall it seems that the slammer blues come inshore and it is one of the most productive fisheries we have here. It is amazing catching such large fish just yards from the beach. It’s great action for the kids as we can catch them either jigging or trolling and we can typically fish in very calm seas. Trolling mann stretch 30’s have been the ticket trolling the 30 to 35 foot depths just a mile or two off the beach. Finding the bird play and bait has been key. Trolling at speeds of 3 or 4 knots works best. Well, the time has come for us to move down the road a bit. 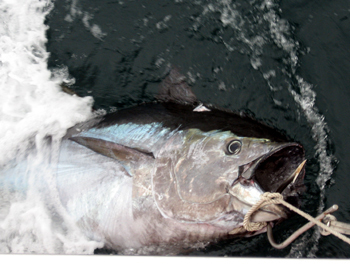 We will be taking both the Low Profile and Justified down to fish for the giant bluefin this year. Capt Keith Burnet will be running Justified while I will be running Low Profile. We will be docked at Portside Marina with fishing just minutes and away. It will be great having two boats this year and having a seasoned Captain such as Keith, working side by side, has me more than excited to start there in the upcoming week. Please feel free to contract me if anyone wants to hop on board. We will be fishing there until the end of January. Stay tuned as next week I will give a little outlook on our trolling tactics and gear we use fishing in Morehead!!! On a sad note, the Abaco's and Treasure Cay lost a great person this week. We were given the sad news that Bradley Russell died on Wednesday from ongoing health complications. Bradley helped us out last season mating on Low Profile. Bradley was a talented fisherman and we appreciated all his help. In his prime he was one of the best bonefish guides and free-divers in the area. He was a man with a heart of gold and good for a laugh. His presence will be missed around the docks this season. Back by popular demand, OU has put together an open seating schedule for the upcoming Bahamas season. Pricing is per person, excludes gratuity, and is based on accommodations aboard the Over Under, 54' Bertram. Hotel rooms are available at an additional fee. Rates include breakfast and lunch aboard. Dinners, drinks, and transportation are excluded. Lots of great pics, interact with our Captains and stay up to date with OU ! OU was feature on the Salt Water Sportsman web-site when Editor John Brownlee fished on That's Right out of Islamorda with Sweepstakes winner Pat White. Check it out here! Follow us for up-to-date audio reports and fish-tweets on what we're catching on a regular basis. Go to www.twitter.com/ fishoverunder and follow us today!! !